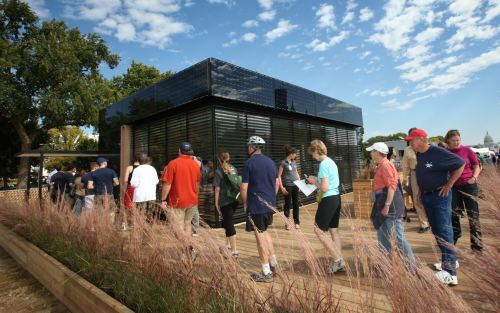 We’ve been watching in eager anticipation to find out which amazing solar powered green home would win this year’s Solar Decathlon. 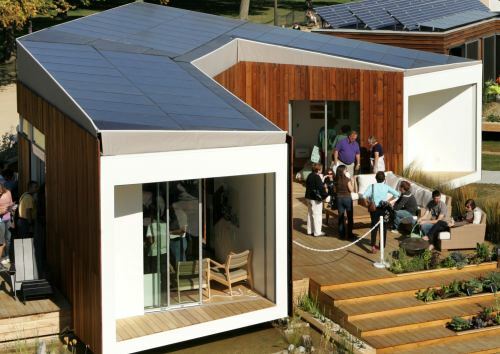 This year marks the fourth competition, with teams from around the world journeying to Washington DC to showcase their most technically advanced and energy efficient prefabricated homes. The best and brightest turned out this year modeling high efficiency home envelopes, solar systems, high-tech home control systems, advanced framing techniques and superb architecture and design. The winners of the competition were announced on Friday the 16th. Read more to learn about the top four winning designs. 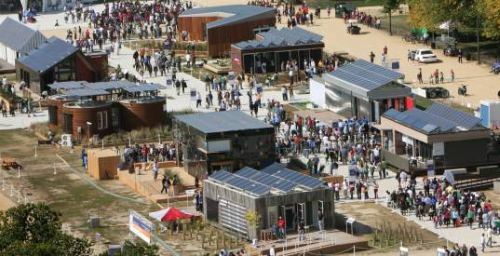 The winner of this year’s Solar Decathlon, is Team Germany from the Technische Universität Darmstadt, who has now won this competition twice in a row. ThesurPlushome is covered on the roof, side and south facing facades with an 11.1 kW solar system, which helped lead them to their big win. With a total of 908 points out of a possible 1,000 points, the PV-covered, two-story cube made a dramatic statement on the lawn of the Mall. Additionally the house featured custom-made vacuum insulation structural panels, automated louver-covered windows, and a boiler/heat pump system that provided both heat and hot water to the house. Inside, the home is one large open room, which operates as the living, dining, kitchen, bedroom and bathroom, while multi-purpose furniture folds out of the way to make more space inside. Runner up was the University of Illinois with their traditionally inspired Gable House. Only 9 points behind Germany, the Gable House proved that traditional architecture could easily be paired with energy efficient design to produce a truly green and sustainable home. The Gable House combines a 9.1 kW system and a gable roof, built on a frame made from structural bamboo. The structural bamboo framing is 10 times stronger than traditional framing and reduces thermal bridging thus making the home more energy efficient. The home is so tight and efficient it actually meets Passive House standards for energy efficient and environmentally sensitive design. Outside the home is clad with 100 year old reclaimed barn wood. Also featured in the home is 12 inches of high performance insulation; a high-efficiency, small air volume heating, ventilation, and air conditioning system custom-designed for the small needs of the house; and LED lighting. Team California, made up of students from California College of the Arts and Santa Clara University, came in at 3rd place with 863 points. Refract House garnered 1st place in Architecture with a strong focus on natural daylighting and layout. Their home was specifically designed for the California climate and combines indoor and outdoor living without sacrificing on energy efficient design. An 8.1 kW solar system is coupled with a solar thermal absorption chiller, a solar hot water system, solar passive design, and high-performance noble gas filled windows for an impressively efficient design. The home’s control systems can be remotely controlled via an iPhone allowing the home owner absolute control. Additionally, the Refract House includes a greywater pond that helps irrigate the landscape. And finally, in 4th place is Team Ontario/BC with their cold climate designed house,North House. Team Ontario/BC’s house was the only home designed to withstand harsh winter temperatures and still maintain the same efficiency standards as the rest of the homes. The house is wrapped in a high-performance glazing and super tight insulation (R-60) and has different configurations for full sun through full shading, optimizing it’s solar heat gain. 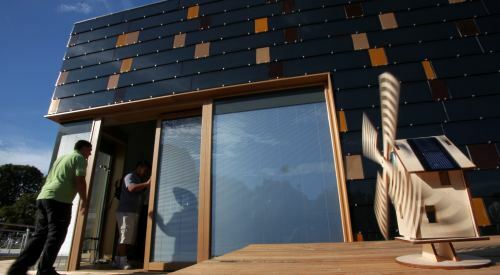 A final coating of thin-film pv (11.9 kW system) allows the home to generate power. The home also features innovative furnishings like a bed that retracts into the ceiling during the day when not in use. The competition Friday October 9th and culminates this weekend with the houses on view for the public through the weekend. See more pictures of the event fromAmerica.gov’s Flickr Page. Also here’s a great video on the event.